Learn more about our network monitoring software for online discovery, topology, mapping and performance and experience your self with our unique features. Switch Center is network management software for managed network switches and hubs from any vendor supporting SNMP BRIDGE-MIB that helps to discover, monitor and analyze networks connectivity and performance. By default, Switch Center is using only single SNMPv1/2 public community, for collecting information from network devices. There are some cases that this community needs to be changed, or other communities need to be used to manage devices with different SNMPv1/2 community strings. Switch Center can support any number of SNMPv1/2 communities, for managing and collecting information from any SNMP network device. 1. From the main menu select the Options >> Settings screen and click on the Snmp icon. 2. From the Additional Options section, enable SNMPv1/2 additional communities and click over it. 3. Add the preferred additional SNMPv1/2 community string and rights. 4. Click the OK button to save the additional SNMPv1/2 communities. 5. Click the Save button on the bottom of the screen to save your settings. By default, Switch Center alerts when specific threshold values has been reached on specific switches ports. There are some cases that the thresholds values need to be changed for managing and adjusting specific network events. Switch Center threshold alerts includes specific ports thresholds and specific ports filters that can be set upon network administration needs. 1. From the main menu select the Options >> Settings screen and click on the Alerts icon. 2. From the Scanning Options section, enable automatic scanning of real-time alerts and click over it. 3. Select the Threshold Options tab and set the preferred network threshold options. 4. Click the OK button to save the threshold alerts options. By default, Switch Center alerts about network switches state up and down only. There are some cases that more alerting options are needed for managing network operational status. Switch Center can alert about additional network states including network switches alerts options and network nodes alerts options that can be selected upon network administration needs. 3. Select the State Options tab and set the preferred network state options. 4. Click the OK button to save the state alerts options. By default, Switch Center is collecting network nodes by using SNMP protocol. The nodes information is collected from the default gateway that configured on the platform that runs Switch Center and from the network segments that connected directly to Switch Center platform. There are some cases that SNMP protocol can’t be used like unmanaged remote networks or specific secured private networks. In that case Switch Center can discover nodes MAC and IP addresses information from Microsoft DHCP servers that used by the remote unmanaged or secured networks computers. 1. From the main menu select the Options >> Settings screen and click on the Nodes icon. 2. From the Discovery Options section, enable nodes discovery from DHCP servers and click over it. 3. Set the preferred DHCP servers IP address or name by using the Add button. 4. Set the preferred DHCP servers administration account that will be used for logon. 5. Click the OK button to save the servers addresses and logon information. 6. Click the Save button on the bottom of the screen to save your settings. By default, Switch Center is discovering SNMP network devices automatically from the entire network. The discovered SNMP network devices can be viewed on the Switches Monitor screen. In order to verify the availability and appropriate SNMP network settings of specific device, Switch Center scanning troubleshooting screen can be used. 1. From the main menu select Tools and click the Scan Device option. 2. On the Scan device screen enter the IP Address of the device and click Start Scan. 3. Wait until the scanning summary section will display the current status of the device. 4. If specific problem has been found correct it or send us the results for additional assistance. By default, Switch Center is not query network nodes, only SNMP network devices. This kind of configuration keeps network resources and management traffic as low as possible. However, there may be need to collect extra information about network nodes and their current logged user names. 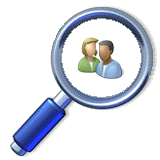 User names scanner can provide information about each network node current logged users. The collected information can be viewed on the Nodes Monitor screen, by selecting specific node and viewing its details. 1. From the main menu select the Monitor screen and click on the Scan Options icon. 2. From the Scan Options section, enable Scan user names and click over it. 3. Select the preferred administration account of your network. 4. Select the exclude tab if you like to exclude specific user names. 4. Click the OK button to save your preferred settings. By default, Switch Center is not query network nodes, only SNMP network devices. This kind of configuration keeps network resources and management traffic as low as possible. However, there may be need to collect extra information about network nodes and their available resources. Node Types scanner can provide information about each network node and its operating system like Servers, Workstations, Printers or Routers. The collected information can be viewed on the Nodes Monitor screen, by selecting specific node and viewing its details. 2. From the Scan Options section, enable Scan node types and click over it. 3. Select the preferred scanning options: Servers, Workstations, Printers or Routers. By default, Switch Center is mapping all discovered switches to each other, by settings each switch uplink and downlinks using its built-in interconnecting links mapping algorithm. The entire map layout can be seen by using the Network Views screen which provides Find, Trace and View options. There are some cases that specific mapping is needed to direct Switch Center to use permanent interconnecting links between specific switches. 1. From the main menu select the Options >> Settings screen and click on the Switches icon. 2. From the Discovery Options section, enable permanent switches connections and click over it. 3. Select the preferred switches display by using Name, IP or MAC address. 4. Use the Add button to select specific switch and uplink/downlink ports. 5. Click the OK button to save all permanent connections. By default, Switch Center is trying to discover network switches, by using SNMP protocol queries, to the default gateway that configured on the platform that runs the software and to the network segments that connected directly to network cards on Switch Center platform. There are some cases that specific configuration is needed to direct Switch Center to the network switches addresses. 2. From the Discovery Options section, enable switches discovery from remote networks and click over it. 3. Set the preferred network address pools in Class-C segments by using the Add button. 4. Click the OK button to save switches networks addresses. By default, Switch Center is trying to discover network nodes by using SNMP protocol queries, to the default gateway that configured on the platform that runs the software and to the network segments that connected directly to network cards on Switch Center platform. There are some cases that specific configuration is needed, to direct Switch Center to specific SNMP enabled network routers for collecting nodes MAC and IP addresses. 2. From the Discovery Options section, enable nodes discovery from remote routers and click over it. 3. Set the preferred SNMP enabled router address as SEED ROOT by using the Add button. 4. Click the OK button to save switches routers addresses. Switch Center network topology can be exported to Microsoft Visio 2007/2010, for creating and managing visual diagrams. This feature is useful for network administrators and designers that would like to create specific organization views. Enabling this feature requires Visio 2007/2010 installation and external database like Microsoft access or Microsoft SQL databases. 1. From the Switch Center main menu select the Options >> Settings screen and click on the Access icon. 2. From the Export Options section, enable Switch Center SQL database export and click over it. 3. Select your preferred database updating schedule and its preferred location. 2. Download Visio Network Topology or Visio Network Topology (64 bit) script. 3. Download Visio Device Topology or Visio Device Topology (64 bit) script. 4. Save both scripts on the same folder on your computer. 5. Open both scripts with any text editor. 6. Delete the remark sign <'> from the first row for using Microsoft Access database and edit its location. 7. Delete the remark sign <'> from the second row for using SQL database and edit its server and database names. 1. Double-click on "VisioNetworkTopology.vbs" file for opening network connectivity diagram. 2. Double-click a device on the topology diagram for opening specific device nodes connectivity. Editors team at 3D2F.com, a leading software directory for freeware, shareware, demo and commercial software, has reviewed and awarded Lan-Secure Switch Center as "Best among the like", saying that it is "the most promising in its class". Switch Center is unique software designed for managing network resources. The software provides a real-time management system that can help you to control your network resources by exploring your network switches and hubs that support SNMP BRIDGE-MIB. The usage of Switch Center is clear and easy and requires no extra knowledge or efforts. The software simply scans the network, combining network discovery and switch port mapping of all network entities. Switch Center gives you the way to explore every single network entity and control them with no remote agents or special network considerations. Switch Center has a great number of useful features, such as node and user discovery, including port location, multiple-vendor network switch ports mapping and scanning, central viewer supporting multiple servers for restricted and isolated networks, and much more. The software gives you an excellent opportunity to get a real-time network connectivity that supports graphical views with real-time reports and statistics that can be exported to a variety of other formats. By the way, with Switch Center you can even export an entire SQL-based along with HTML code, so you can easily update your online information. In addition, with Switch Center you get multiple levels of management users and access permissions that are really useful. Switch Center system is a complete management suite for network switches and peripheral devices that help to discover, monitor and analyze your network connectivity and performance in the best way. By Default, Switch Center is using SNMPv1/2 protocol for network discovery. SNMPv3 can be enabled for switches and routers discovery, on all networks or by selecting specific networks. This feature is useful for secured organizations that using SNMPv3 protocol in their networks. 2. From the Additional Options section, enable SNMPv3 and click over it. 3. Set the username and the preferred security options, the context name and engine ID should be blank for automatic resolution. 4. Set the networks that will be using SNMPv3 discovery or use the default option for all networks. Switch Center enables specific permissions configuration for remote users. This feature is useful for viewing and controlling Switch Center, by multiple network administrators and operators with different levels of control. 1. From the main menu select the Options >> Settings screen and click on the Access icon. 2. From the Users Options section add a new user by clicking the Add User button. 3. Set the username/domain/computer that the user is using to connect Switch Center from his remote viewer. 4. Set the user permissions by checking all the screens that the user will be able to access from his remote viewer. Switch Center can be displayed and managed by unlimited remote computers. This feature is useful for viewing and controlling Switch Center, by multiple network administrators and operators. 1. Enable sharing on the server installation directory using windows directory options. 2. Run Switch Center installation on the remote platform while uncheck the Engine Service on the select components screen. 3. After installation completed select from the main menu the Options >> Settings screen. 4. On the Local screen under the Servers Options section click the Add Server button. 5. From the Add Server screen select the installation directory of the main server platform by using its network address or network drive map. 6. After adding the server use right click to Set as Default Server or Rename it and then click the Save button on the bottom of the screen. 7. Select the server and use the Connect button or use the main menu options screen to connect to the main server.